Not All That Wanders Is Lost • Traveling Threads Bee Quilt is Finished | OccasionalPiece--Quilt! 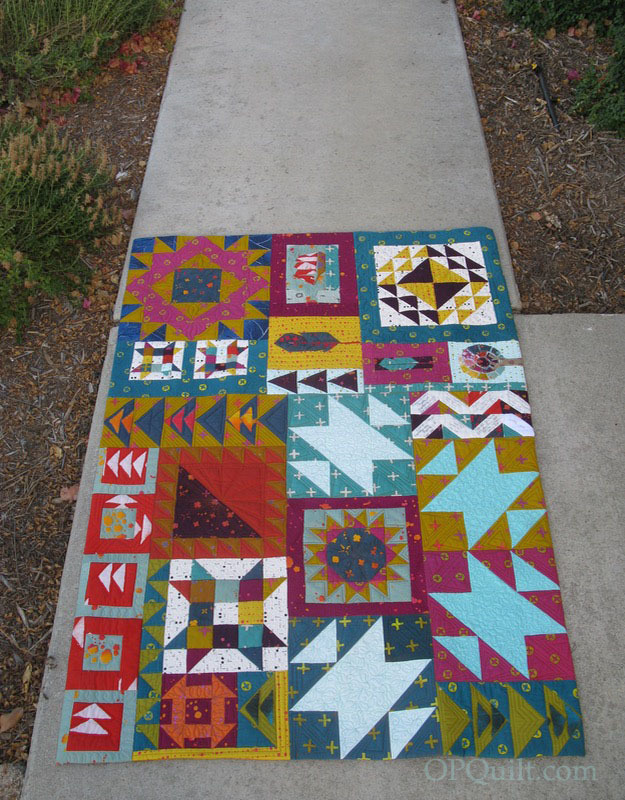 I have loved watching this quilt come together and the final product is just wonderful! All the quilts are quite lovely and so very different. Thanks for sharing the final product and that handy reminder about faced bindings! You’re always such an inspiration. I love how your quilt turned out. 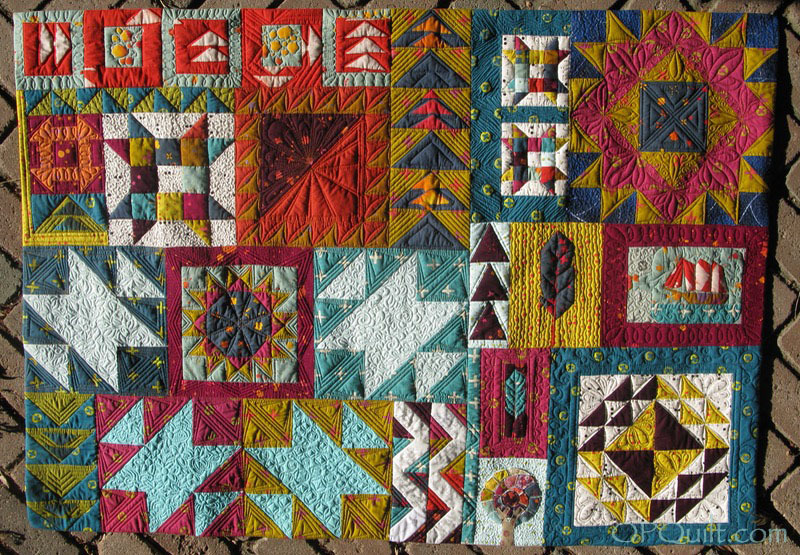 Sampler quilts are my favorite and this reminds me of a modern take on one. Liz and Elizabeth are two of my favorite designers. Would love to add their book to my library. This sampler is amazing…love it!! 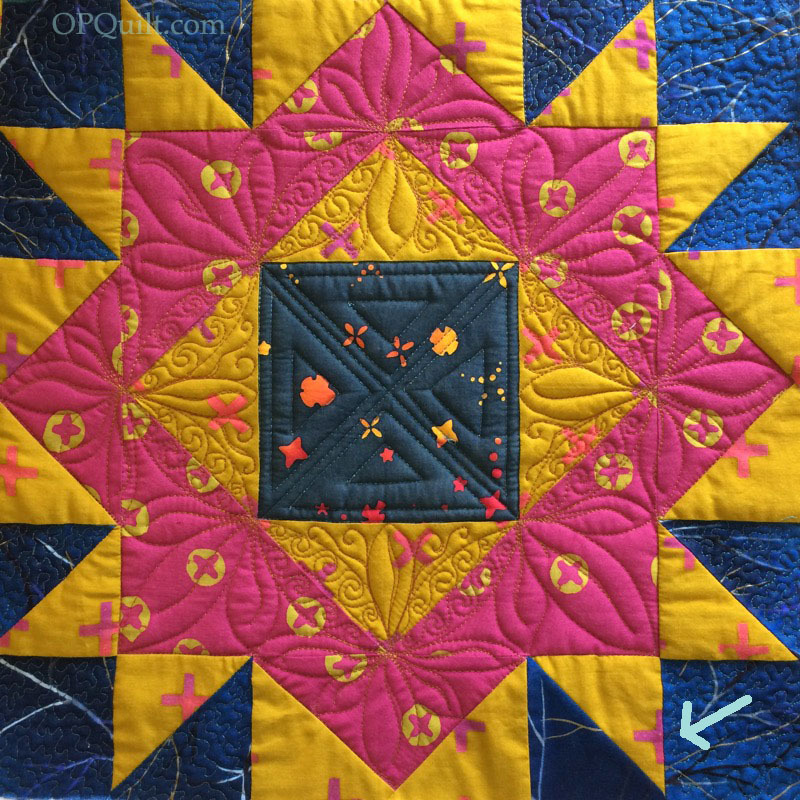 This is a gorgeous quilt and these are not beginning quilters! Years ago I belonged to a group of twelve women in the Seattle area. The number of members was because there are twelve months in the year. Each woman hosted a monthly meeting at her home. She would hand out ziplock bags of her fabrics and pattern of choice to the other members who would complete them and bring the finished square to the next month’s meeting. Each month a woman went home with all her squares finished. Often, by the next meeting we’d all see a completed quilt top. The most interesting one was the month we were given fabric and a finished square size and told to use any pattern we wanted to. It was a fabulous quilt top! 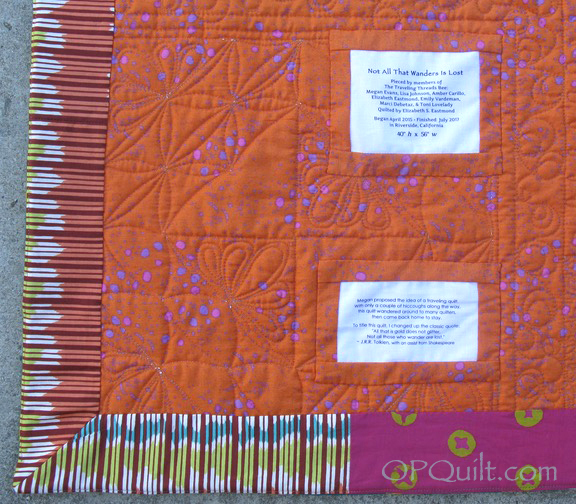 I like the invisible binding as it does add to the quilt’s clear lines. This is a real beauty, Elizabeth. It was fun to watch it partially come together at the beach and to see how beautifully you have quilted it through your IG posts. I’ve even used some of your scraps in my work! I hope you are keeping this one for yourself. Good catch on the unquilted triangle! 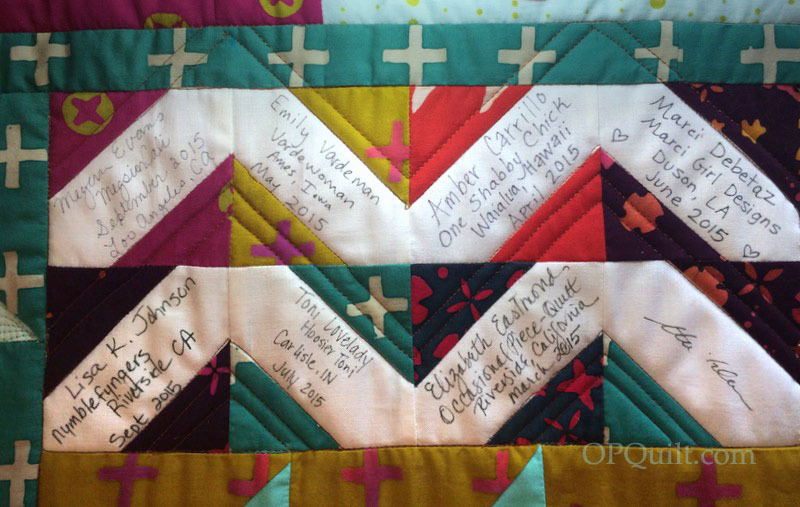 It is a lovely quilt and I love the sentiment and meaning behind its name. I’m sure you will feel an extra warmth when you use it from those who contributed. Thanks for the chance to win. I would love this book. It’s so good to see the completion–what a journey it’s been. Lovely quilting. The Simple Simon Guide to Patchwork Quilting looks like a fantastic book. Thank you for the giveaway opportunity! “Not all who wander are lost” is a great name for this traveling quilt. I love your explanation and it reminds me I have a traveling improv piece to quilt!!! I jumped over to look at your tutorial on the hidden binding and it is exactly as I do it. Of course; our great minds thinking alike again. Your quilt is a masterpiece of friendship and piecing. A month each is a bit tight. We allowed 6-8 weeks on our travelling medallion quilts, and even that was a struggle sometimes. But the result is all worth it!